Good news! Call center agents are in demand! You don't need a call center resume! You can just send in a selfie of you playing with a fidget spinner and you'll get the job. That's true if you want a soul-sucking call center job. One where you repeat an outbound call center script like Nina from Office Space. But you don't want that job. You want one with great pay, benefits, and a relaxed, fun work environment. To get that job, your call center agent resume must stand out like a paycheck with an extra zero. A call center resume example better than 9 out of 10 other resumes. How to write a call center resume that will land you more interviews. Tips and examples of how to put skills and achievements on a call center resume. How to describe your experience on a resume for a call center to get any job you want. 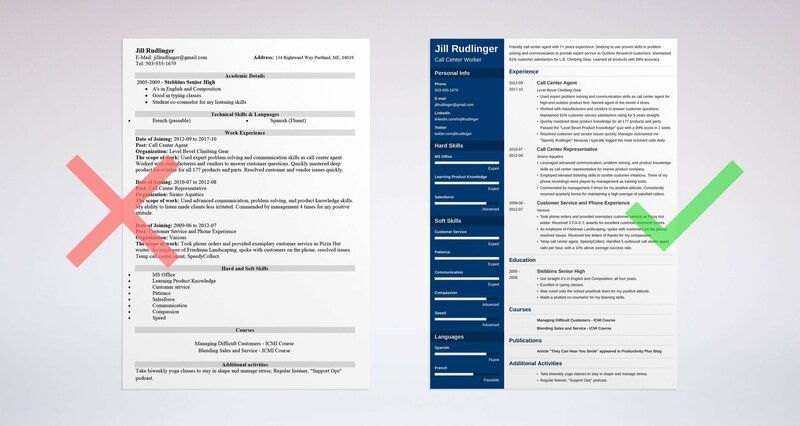 Here's a sample resume for a call center representative made using our resume builder. What's the Best Format for a Call Center Resume? The hiring manager just negged your call center agent resume. There's nothing wrong with your experience. Your skills are great. You've even got some fantastic achievements. You picked a bad call center resume format. Faced with slogging through a word swamp, the call center director basically hung up on you. The real tragedy? She hired someone less qualified. Start your resume off right. 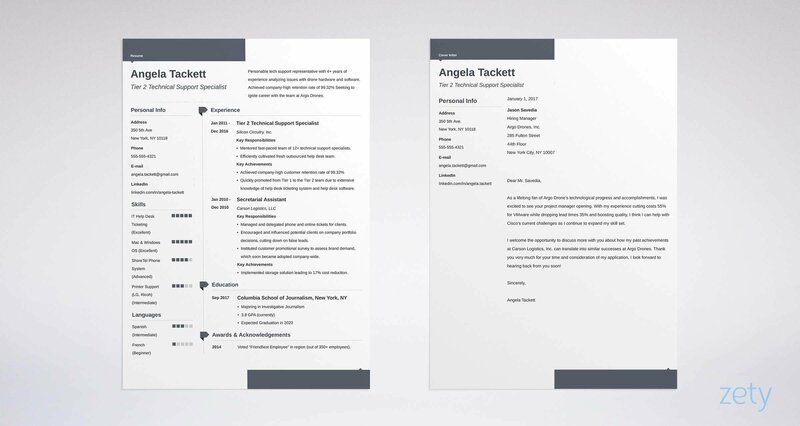 Pick a trusted customer service resume format like the reverse-chronological layout. It puts your most recent accomplishments up top. Use clear, legible fonts and big headings. Add white space to give the manager's eyes a break. Save your work as a PDF. Call center resume PDFs preserve their layout. MS Word resume templates can get their wires crossed in transit. Pro Tip: Make sure the job description doesn't prohibit PDFs. If it does, you may wind up with a dropped call. Having doubts about the reverse-chronological format for your call center representative resume? See other formats in our guide: "3 Resume Formats: How to Choose the Best One [Examples]"
Can you explain why I should hire you in just six seconds? That's how long the average hiring manager looks at each resume. If it makes you want to crawl under your desk and weep, take heart. The resume summary and resume objective are here to help. Done right, they can turn that six seconds into a new job. A resume summary uses your experience to prove you fit the position. Choose it if you've already got permanent headset hair. A call center resume objective shows your excitement. Use it if you've never so much as spoken to an angry caller. See if you can spot the differences between these inbound call center resume samples. Call center representative with seven years experience. Highly skilled in problem solving, communication, product knowledge, and providing customer satisfaction. Looking for a new call center job. What's the problem? Nothing, if it's the only call center agent resume you read. Friendly call center agent with 7+ years experience. Seeking to use proven skills in problem solving and communication to provide expert service to Outdoor Research customers. Maintained 91% customer satisfaction for L.B. Climbing Gear. 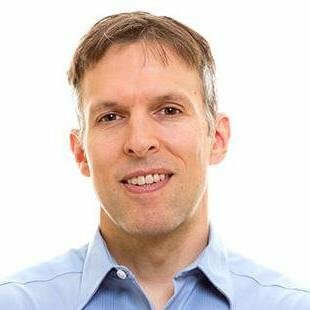 Learned all products with 99% accuracy in just 1 week. See? As different as a live operator and a recorded message. But it just needed measurable accomplishments. Don't have that kind of experience? Think your customer service resume for call center jobs will read like a deleted transcript? Then use a resume objective. But here's a trick: even a call center resume with no experience should show some. Energetic employee seeking call center jobs. No experience yet, but I'm skilled at customer service and communication. Look again at the first of our entry-level call center resume samples above. It's as memorable that episode of The Office where Michael pops the question. But where did a call center fresher get that kind of experience? Pro Tip: It's a lot easier if you write your outbound call center resume objective or resume summary last. Fill it up with highlights from your resume. You don't need experience to get just any call center job. If, on the other hand, you don't want every day to feel worse than the one before, you'll need a lot of it. The key is not to list it all in your call center resume. Stick with the experience that matches this call center job. If you do, you'll fit the opening like Silly Putty. Employed expert problem solving and communication skills as call center agent for high-end outdoor product firm. Named agent of the month 4 times. Worked with manufacturers and vendors to answer customer questions. Maintained 91% customer service satisfaction rating for 5 years straight. Quickly mastered deep product knowledge for all 177 products and parts. Passed the "Level Bevel Product Knowledge" quiz with a 99% score in the first week. Resolved customer and vendor issues quickly. The call center executive nicknamed me "Speedy Rudlinger" because I typically logged the most resolved calls daily. Worked as call center representative for climbing gear company. Answered customer questions on the phone. Responsible for learning product knowledge. Responsible for resolving issues with customers and vendors. That first inbound call center resume sample works like a custom ergonomic keyboard. The second? It'll block you like the Do Not Call Registry. Most call center job descriptions don't ask for experience. The good ones do. If you want those jobs, here's how to give your resume for call center jobs a direct line to greatness. First, look at your past jobs. Ask, did I perform call center duties and responsibilities? Maybe you talked on the phone, worked with customers, or used computers. Second, do a day or two of temp work in a call center. Even a couple hours will help. Call Center Experience: None yet, but I'd love to work for you! You can probably get a job with that. But it won't be a good one. Took phone orders and provided exemplary customer service as Pizza Hut waiter. Received 3 F.A.S.T. awards for excellent customer comment scores. At Friedman Landscaping, spoke with customers on the phone, resolved issues. Received two letters of thanks for my compassion. Temp call center agent, SpeedyCollect. Handled 5 outbound call center agent calls per hour. The call center quality analyst reported my success rate at 10% above average. Now that call center resume sample works like a Cisco 50-line phone. The HR manager is already looking for your contact info. But even a junior call center employee can have customer service resume like that. Are you writing a call center supervisor resume? If so, use the strategy above. If you've got call center manager experience, show it. If not, list any management experience at all. Call center experience plus general management experience will get attention like a flaming fidget spinner. Pro Tip: Temp jobs make good general or medical call center agent resume perks. That said, be careful. Temp-to-hire can be a scheme to dodge employee benefits. Think you don't need much education for a call center resume? But putting education on a resume is like being nice to coworkers. It's not required, but it pays off big. Then add details that show you're worthy of the interview. Got straight A's in English and Composition, all four years. Was voted onto the school yearbook team for my positive attitude. Was made a student peer counselor for my listening skills. Graduated with a high school degree. That first professional call center resume example paints the picture of a good phone worker. The second gets a busy signal. Pro Tip: If you're specifically writing a help desk resume, pick different achievements for your education section. See our guide on writing help desk call center resumes here. Want to make your call center agent resume stand out like Alexander Graham Bell's first call? See our guide: "How to Put Your Education on a Resume [Tips & Examples]"
Let's peek into the hiring manager's office. Beside it, on her desk, a pile of 350+ call center resumes stretches toward the ceiling. On every single resume, she sees the same skills list. "Great with people. MS Office skills. Experience with CRMs. Question: Why should she pick you? Because you used your call center rep resume to prove your skills. First, you read the call center agent job description. You highlighted all the call center skills you saw. Next, you put those skills in your call center agent resume, plus a couple more for effect. Let's say the call center position values problem solving and listening. You add those to your customer service resume for call centers. Then you include positive attitude to round the picture out. Leveraged advanced communication and problem-solving skills as call center representative for marine product company. Employed elevated listening skills to soothe customer irritations. Three of my phone recordings were played by management as training tools. Commended by management 4 times for my positive attitude. Consistently received quarterly bonus for maintaining a high average of satisfied callers. Used expert problem-solving skills to resolve issues. Scored in the top 95% for the company's "Did we resolve your problem?" survey question. There. That's better proof than a recorded call. Now let's get you up and running with some sample call center resume skills. Add to them from your experience, and from job offers online. Follow the steps above, and you'll look like LeBron James with Helpdesk experience. Just make sure not to list skills you don't have. Dishonesty will thwart you during call center agent interview questions. Pro Tip: Bank call center resume skills for customer service are one thing. Outbound sales skills for a product manufacturer are something else. Always match your skills to the job offer. Want to put your skills section high up in the queue? Use the call center resume template from the top of this article. Also, see this guide: "+30 Best Examples of What Skills to Put on a Resume (Proven Tips)"
The HR manager reads all 300+ call center resumes. She narrows it down to the best. It turns out to be you. You know that isn't how it goes. In reality, she tosses out the resumes for call centers with spelling errors or poor formatting. She drops more because they don't show the right experience or skills. Of the remaining 100, she picks 25 to interview at random. Your call center csr resume must reach out and grab her. You'll do that with "other" sections that prove you fit the job like a Herman Miller chair. Take bi-weekly yoga classes to stay in shape and manage stress. Regular listener, "Support Ops" customer service podcast. That first call center resume sample draws the eye like a Batman mask on casual Friday. The second? Wrong number all the way. Don't have any good "other" items? Start some. Take a class or two, or listen to a customer service podcast once a month. You can even list on-the-job trainings in your "other" sections. They'll stand out better there than in your customer service call center resume job description. Still confused about what to list? Ask yourself, "What does a call center representative do?" Then pick accomplishments that match the answer. Pro Tip: Are you writing an inbound call center representative resume? If so, think of "other" bullet points for inbound skills like sales and typing. Need help with the "other" sections of your call center agent resume? See our guide: "+20 Best Examples of Hobbies & Interests To Put on a Resume (5 Tips)"
"You should never write a cover letter." Says every call center representative who doesn't know how to do it. Boring cover letters do no good. A good one can put the spotlight on your upcall call center resume. Take a tip from Coca Cola. When they started putting names on bottles, their sales grew for the first time in a decade. So, use the hiring manager's name. You may need to dig to learn it, but it's worth it. Personalize your call center cover letter more by adding a fact you love about the company. Then, cite an accomplishment that shows how you can help. This works best if it fits the biggest need from the call center resume job description. Outdoor Research is the queen of outdoor gear. I would love to be its champion. One reason I'd excel? My L.B. Climbing Gear manager called me "Speedy Rutlinger" because I typically logged the most resolved customer calls daily. That'll satisfy the hiring manager like a newly wet-wiped headset. Close with a call to action. You can just say, "I'd love to talk with you about your needs." Pro Tip: A cover letter isn't a litany of everything that's good about you. It's one eye-catching fact, plus a demonstrated knowledge of the hiring manager's needs. Want to write the best call center cover letter? Need a sample cover letter to work from? See our guide: "How To Write A Cover Letter [Complete Guide With Examples]"
You also know the HR manager won't hire HarrySwatterBeerLovinFool1987@yahoo.com as a call center representative. But did you add your LinkedIn profile? A LinkedIn profile lets you show a little more about yourself. Even better, 87% of all hiring managers use LinkedIn. You can also add Twitter and other social hangouts to your great call center resume. Pro Tip: Don't have a LinkedIn profile? Need to optimize it for your call center customer service representative resume? See this guide on LinkedIn mastery. Want even more great tips for your customer service call center resume? Trying to write a resume for a data entry job? See these guides: "How to Make a Resume: A Step-by-Step Guide (+30 Examples)" AND "Data Entry Resume: Sample & Complete Guide [+20 Examples]"
Start with the call center job description. Highlight all the skills in it. You'll need them for your upcall or insurance call center resume. Prove the skills. Do it with bullet points in the experience section of your call center quality assurance resume or csr resume. "Other" sections make great additions to resumes for call center agents. Pick strengths that make you stand out in a good way. This works in anything from call center supervisor resumes down to resumes for call center representatives. Do you have questions on how to write a great resume for a call center job? Not sure how to describe your skills or achievements? Give us a shout in the comments! We love to help!